…nothing. Dead expressions that at best seem bored, at worst, confused or even hostile. There may be no worse feeling than losing your audience in the middle of a presentation. But there is one simple piece of advice that any experienced presenter will offer: regularly check in with your audience. Where we tend to plunge ahead with our carefully planned deck, we often lose connection with how our audience is reacting. The best way to ensure you will stay connected with your audience is to stay flexible. Can I go over anything again? Do I need to reestablish context? Perhaps I need to skip ahead to my call to action? The point is to get away from a non-stop, one-way broadcast of your message and become more aware of what your audience needs. Having built-in intervals of interaction is not just good in theory. Molecular biologist John Medina studied the relationship between attention and the brain, contending that you need to change gears in your presentation at least every 10 minutes to maintain engagement. Even if you feel confident that your topic is not dull or boring, Medina has found that attention starts to wander naturally after 10 minutes. That being said, we encourage people to check in more often – whenever it feels natural. 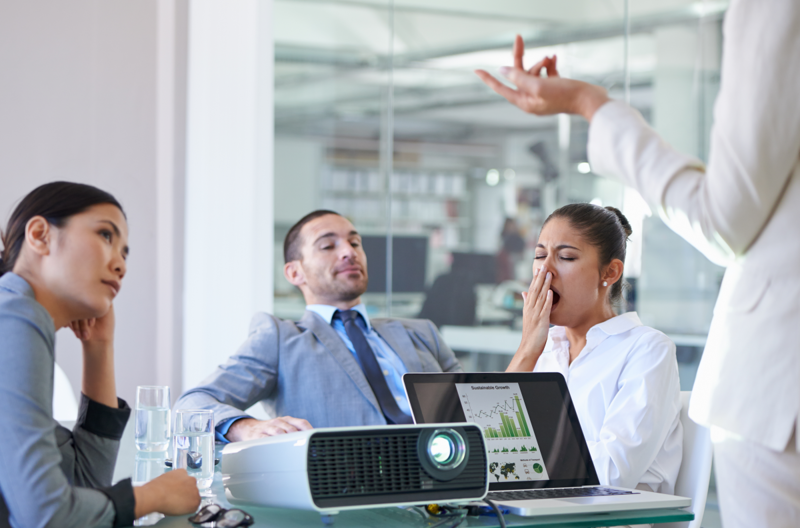 Especially when presenting to executives, you should check in very often to ensure you haven’t lost this notoriously restless crowd. So, take a moment often to gather your breath, ask the audience if they need clarification or additional detail on any points, or even ask them a question to get a two-way dialogue started. The point is to be mindful and not wait until you have a flagging audience. Instead of treating your audience like a sounding board, use their reaction to propel you forward. There is no better way to ensure that you will check in with your audience than to build “check-ins” right into your slide deck. For starters, try building in a pause with a visual Q&A slide. Or, ask a simple question on an otherwise un-cluttered slide. Want to really get someone’s attention? Construct a feedback exercise! The point is, instead of relying on yourself to remember to stop every few slides for check-in, let yourself bump into them so you can let your audience guide you where they want you to go next. They will be more engaged. They will get the information they need. And you will be able to relax. Panic averted! For more information about our Corporate Storytelling workshops, check us out here.